Muscles once thought “uniquely human” have been discovered in several ape species, challenging long-held theories on the origin and evolution of human soft tissues. The findings question the anthropocentric view that certain muscles evolved for the sole purpose of providing special adaptations for human traits, such as walking on two legs, tool use, vocal communication, and facial expressions. Published on April26, 2018 in Frontiers in Ecology and Evolution, the study highlights that thorough knowledge of ape anatomy is necessary for a better understanding of human evolution. 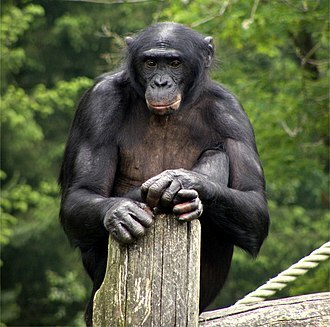 The article is titled “First Detailed Anatomical Study of Bonobos Reveals Intra-Specific Variations and Exposes Just-So Stories of Human Evolution, Bipedalism, and Tool Use.” "This study contradicts key dogmas about human evolution and our distinct place on the 'ladder of nature,'" says Rui Diogo, PhD, an Associate Professor in the Department of Anatomy at Howard University in Washington, DC. "Our detailed analysis shows that, in fact, every muscle that has long-been accepted as 'uniquely human' and providing 'crucial singular functional adaptations' for our bipedalism, tool use, and vocal and facial communications is actually present in the same or similar form in bonobos and other apes, such as common chimpanzees and gorillas." Long-standing evolutionary theories are largely based on the bone structures of prehistoric specimens -- and, according to Dr. Diogo, also on the idea that humans are necessarily more special and complex than other animals. These theories suggest that certain muscles evolved in humans only, giving us our unique physical characteristics. A team of researchers from the University of California, San Diego (UCSD), published a study on March 23, 2018, evaluating a new strategy to analyze blood samples to search for clues indicating the presence of pancreatic cancer. The article, published in ACS Nano, is titled “Integrated Analysis of Exosomal Protein Biomarkers on Alternating Current Electrokinetic Chips Enables Rapid Detection of Pancreatic Cancer in Patient Blood.” Patients whose pancreatic cancer is diagnosed early have a higher chance of long-term survival and increased access to treatment options, including surgery. However, there is currently no standard screening program or effective early detection strategy for pancreatic cancer. Researchers and organizations like the Pancreatic Cancer Action Network (PanCAN) are dedicated to identifying ways to effectively diagnose the disease earlier and improve patient outcomes. The new study from the UCSD team analyzed blood samples from people who had been diagnosed with pancreatic cancer, and compared them to blood from healthy individuals. Specifically, they isolated small particles, called exosomes, from the blood samples. Exosomes are tiny fluid-filled sacs that can contain protein and genetic material called RNA, which can provide information signifying the presence of disease. Previous work, such as a project conducted at MD Anderson Cancer Center (https://www.pancan.org/news/blood-test-could-potentially-diagnose-pancre...), has also focused on exosomes as a biomarker, or detectable and measurable substance that can indicate what’s happening inside a person’s body.